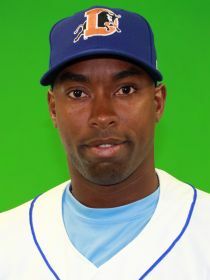 Leslie Anderson was named to the 2012 International League All-Star team today. He’s the only Durham Bull to make the squad. He also eased into first place in the batting stats holding at .313. Rich Thompson is lurking back at .310 and in a tie for third place. As noted in the comments to yesterday’s post, Sean Rodriguez broke his hand hitting locker after Sunday’s game. He is off to see the Rays’ hand specialist and may be out for the rest of the season. Goes to show you how little we fans can possibly know about what happens outside the lines of this sport. What we do know is that he helped the Bulls in the two games he played. A couple of links here and here. Meanwhile, over in Alabama Biscuits catcher Mayo Acosta, who had nine games with the Bulls earlier in the year, had his ankle broken in a plate collision. The Bulls' Craig Albernaz has been sent there to lend a hand. The Biscuits are in a run for the end of year playoffs. However, Hurricane/Tropical Storm Isaac is playing havoc with schedules in the Southern League. In the International League wild card Pawtucket picked up a game on Lehigh Valley and now leads by a game and a half. Bloggers comment here and here. Lastly, a chart to dream about as we wait for tonight’s game against Norfolk. 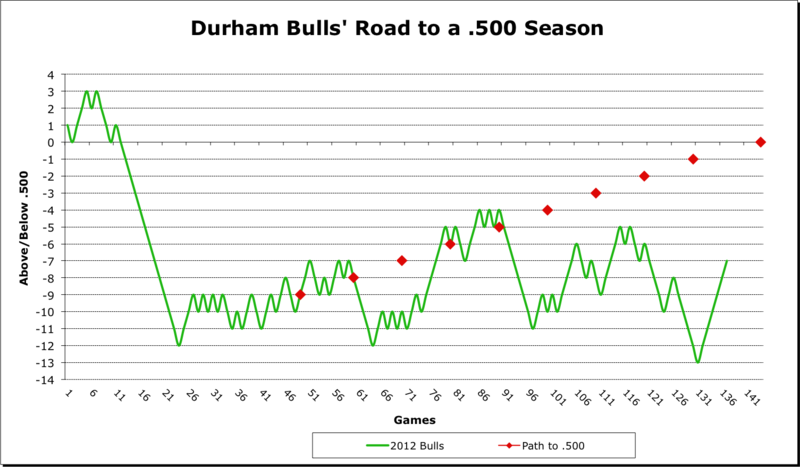 When last we looked at this chart the Bulls needed to play .600 ball to get to .500 by the end of the season. Didn't happen. 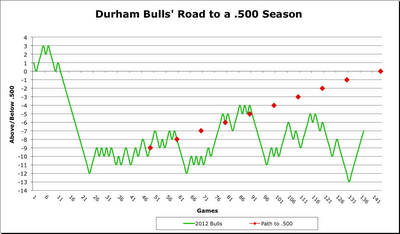 Now they need to win all of their games to reach .500 by the end of the season. Maybe, just maybe?